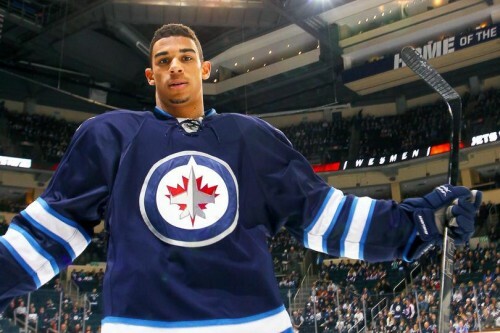 Home/Featured/Are the Jets Looking to Trade Evander Kane? For those who are unaware of the drama going on in the Jets locker room, I’ll so kindly fill you in. Kane showed up to a team meeting in his hometown in a track suit; his teammates weren’t big fans of this. It’s a violation of their dress code, so apparently to “send a message” Byfuglien tossed the clothes into a cold tub. Following this, Kane did not take the team bus to the game, however this isn’t mandatory. According to Sportsnet, Evander Kane missed a pre-game meeting as well, and then after several calls, he answered and said he would not be playing in the game against Vancouver. It was announced on Friday that Kane would undergo season-ending surgery for his shoulder. He’ll be out for 4-6 months. Several sources said that the Jets are ~listening~ to offers for Kane. I would be lying if I said I was bummed about that. Even when they were in Atlanta, he never seemed to quite… mesh with everyone else. Personally, I think this is a great opportunity to get someone who might work better in the Jets organization. Kane is a good player, it’s his sixth season with the team, but I do think he would be better suited somewhere else. My fear is that in light of the recent showcase of Kane’s behavior, he might be a little harder to pass along to another organization. Again, he is a good player, but just not a good fit in the ‘Peg. With 22 points (10G, 12A) in 37 games this season, he’s just not performing the way he used to. He’s never been a star performer as far as points are concerned, but he’s been pretty consisted in the 20-ish goal range, with the 2011-2012 season being his standout season.